“Literacy is a Socio-Historic Phenomenon with the Potential to Liberate and Oppress.” With Kate Vieira, Lauren Heap, Sandra Descourtis, Jonathan Isaac, Samitha Senanayake, Brenna Swift, Chris Castillo and Ann Meejung Kim, Kassia Krzus Shaw, Ola Oladipo, Kassia Shaw, Xiaopei Yang, Patricia Ratanapraphart, Nikhil Tiwari, Lisa Velarde, and Gordon Blaine Wes. (re)Considering What We Know: Learning Thresholds in Writing, Composiion, Rhetoric, and Literacy. Eds. Linda Adler-Kassner and Elizabeth Wardle. Forthcoming. "Rime of the Reagan Library: Remixing Digital Literature as a Critical Method." With Rick Ness and Lauren Gottlieb-Miller. Hyperrhiz: New Media Cultures 15.1 (2016). "'Beyond Discussion': Basic Composition as a Social Imperative." Reimagining Education Reform and Innovation. Ed. Matthew Lynch. New York: Peter Lang, 2014. "'The Poor Little Working Girl": The New Woman, Chloral, and Motherhood in The House of Mirth." The Association for the Study of Ethical Behavior in Literature Journal 9 (2013): 19-22. 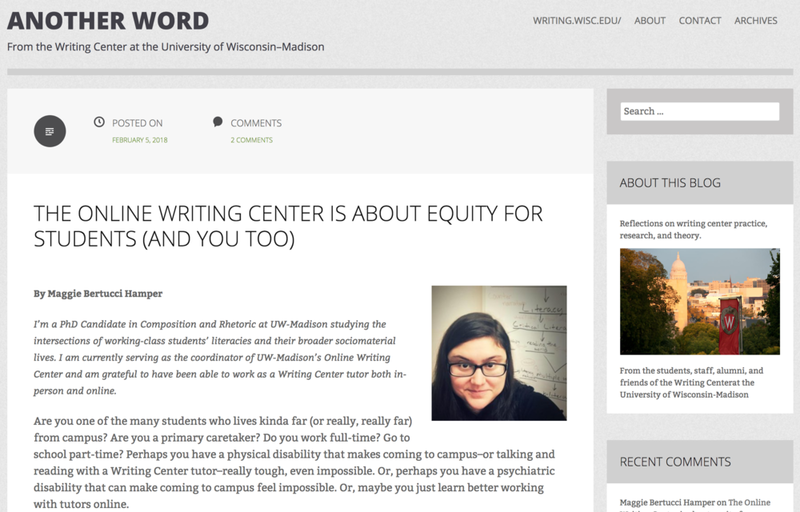 "The Online Writing Center is About Equity for Students (and You Too)". Another Word: From the Writing Center at the University of Wisconsin–Madison (February 2018). Review: Watson Keynote Session 2: Carmen Kynard, “Pretty for a Black Girl.” DRC: Digital Rhetoric Collaborative (Watson Reviews, 2016). "I Do It, You Do It, We Do It: Modeling Topic Invention and Essay Development in the Basic Writing Classroom." The National Association for Developmental Education's Special Professional Interest Network in English/Writing/ESL Newsletter 4.1 (November 2013): 2-5. “From ‘Hostile Mental Children’ to ‘Strangers in a Strange World’: Dysfunctional Discourses in the Study of Basic Writing from 1939-2013.” Under review. “How Basic Writing Can Make Students’ Writing Remedial: A CHAT Analysis.” Under review. “Single Moms and Social Mobility: How Writing Does (and Doesn’t) Matter.” Conference on College Composition and Communication. Pittsburgh, Pennsylvania: March 2019. “When Activity Systems Collide: What Basic Writers’ Out-of School Literacies Have to Teach Us.” Conference on College Composition and Communication. Kansas City, Missouri: March 2018. “The Material Conditions of Literacy Learning: Mobilizing Student Narratives Toward Pedagogies of Social Mobility.” Thomas R. Watson Conference on Rhetoric and Composition. Louisville, Kentucky: October 2016. “Basic Students or Basic Writers? Complicating the College Readiness Model.” Conference on College Composition and Communication. Houston, Texas: April 2016. "From 'Hostile Mental Children' to 'Strangers in a Strange World': The College Readiness Model in Basic Writing." Rethinking Basic Writing: New Ideas and Perspectives. Conference on College Composition and Communication. Tampa, Florida: March 2015. 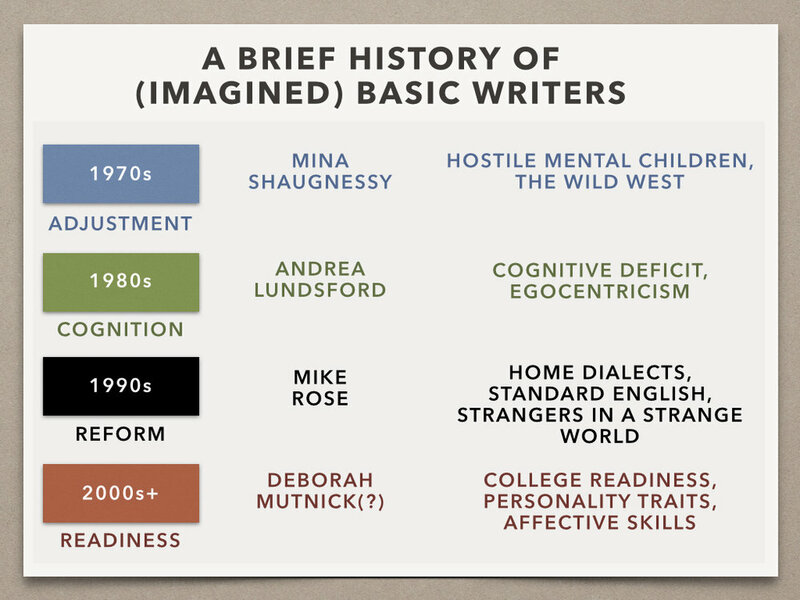 "From 'Hostile Mental Children' to 'Strangers in a Strange World': Basic Writers and Figured Worlds from 1969 to 2013." Modern Language Association Annual Convention. Vancouver, British Columbia: January 2015. Hamper, Margaret Bertucci, Julia M. Garrett, and Stephanie Larson. "Basic Writers in the Looking Glass." Thomas R. Watson Conference. Louisville, Kentucky: October 2014. Hamper, Margaret Bertucci, Lauren Gottlieb-Miller, and Richard Ness. "Crimes Against the Humanities: Remixing Stuart Moulthrop's Reagan Library." Electronic Literature Organization Conference. Milwaukee, Wisconsin: June 2014. "Beyond Discussion: Basic Composition as a Social Imperative." Annual Convention of the National Council of Teachers of English. Boston, Massachusetts: November 2013. Hamper, Margaret Bertucci, Lauren Gottlieb-Miller, and Richard Ness. "Remixing Reagan Library." Midwestern Conference on Literature, Language, and Media. Dekalb, Illinois: March 2014. "To Prostitute Your Vote: Prostitution and Politics in Post-Revolutionary America." Ninth Annual Louisiana Conference on Language, Literature, and Culture. University of Louisiana in Lafayette. Lafayette, Louisiana: March 2010. "The 'Real' Dunbar-Nelson 'Stands Up': Filling in the Gaps on Alice Dunbar-Nelson's Feminism. "Fourth Annual Southern Illinois University Carbondale Graduate Conference in Literature and Rhetoric/Composition. Carbondale, Illinois: March 2010. "Turning Students into Experts: A Research-Driven Perspective for First Year Composition." Southern Illinois University Carbondale Pre-Semester Workshop. Carbondale, Illinois: August 2009. "The New Woman's Drug in the House of Mirth." First Annual College of Saint Rose Women's Studies Conference on "Feminism, Activism, and the Academy." Albany, New York: March 2007. "Why He Killed the Very Birds He Loved So Much: California's Drug Problem in Sara Orne Jewett's 'A White Heron.'" Eastern Illinois University's English Studies Student Conference. Charleston, Illinois: April 2007. "Graduate Study in Composition & Rhetoric at A UW-Madison: Panel Discussion." UW-Madison Department of English. Madison, Wisconsin: September 2016. "Teaching Composition at UW-Madison: A Panel Discussion." UW-Madison Department of English. Madison, Wisconsin: March 2016. "Fieldwork Fundamentals: Planning for the IRB, Recruiting Participants, Collecting Data, and Navigating Relationships in Ethnographic and Interview Research." Brownbag talk, UW-Madison Department of English. Madison, Wisconsin: April 2016. "Administrative Opportunities at UW-Madison: A Panel Discussion." UW-Madison Department of English. Madison, Wisconsin: August 2016. "Teaching English 100 at UW-Madison: A Panel Discussion." UW-Madison English 100 Program. Madison, Wisconsin: July 2015. "What Do We Teach When We Teach Writing?" Symposium: From High School to College: Engaging in the Writing Dialogue. Greater Madison Writing Project and the UW-Madison Department of English. Madison, Wisconsin: January, 2015. *Note: Squarespace does not provide support for anchored hyperlinks in Chrome. If you wish to use these hyperlinks, please choose a different browser.